After a few days off, I was back to work early this afternoon. I’ve been struggling lately with the “middle muddle” and felt stuck in the mud in the midst of Part 2 of the novel, but thanks to some reworking of my outline, and some quality thinking time cleaning 4 bathrooms and vacuuming all three levels of the house, I managed to push through it today and I feel good about it. 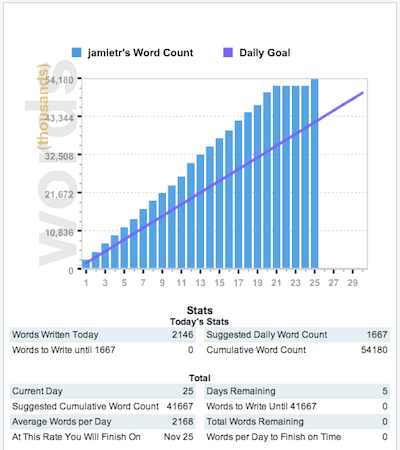 I managed 2,146 words for a 25-day total of 54,180 words. I had intended to treat the holiday today as a “weekend” day and get up at 7am and do my writing, but I slept in. I plan on being back to my normal routine tomorrow. In the meantime, I was pleased with what I wrote today. It was a brute-force push through the middle-muddle, but it introduced two significant subplots which will carry me through the remainder of Part 2 (roughly 6 more chapters) with what I think is a set of interesting and exciting story lines. This is around where I died last year after winning NaNoWriMo. For some reason, the pressure is off when you win, and that is a bad thing for me because I work so well under that competitive pressure. Without that pressure, I have to work even harder just to get going. But I think that today’s writing was a turning point. I’m already looking forward to Chapter 25 tomorrow.